The pterosaur was an amazing creature that has captivated people of all ages for many years. They may not be as popular as the land-roaming “dragons” but they have plenty of their own features that make them unique. Obviously the most well-known part of pterosaurs would be their wings. But, unlike today’s birds they did not have feathers. Instead, they had wings much like a bat. As you probably know, the bat has a thin membrane stretched between its last bone of the wing and that membrane connects to the body. The same thing appears in pterosaurs. 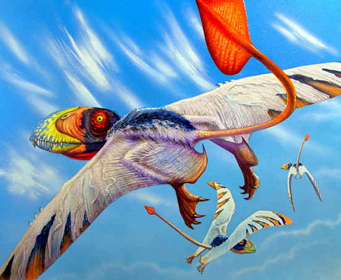 However, the pterosaurs are unique in as they had a “wing finger”. In fact, the first pterodactyloid was named for its wing finger, thus making it Pterodactylus. This wing finger, as scientists call it, is actually an extension of the ring finger. If you had a hand like a pterosaur you would have a ring finger that extended three feet! These wings have also been found with what would seem to be fur. But, later scientists came to the conclusion that this “fur” was probably remnants of structures that held the membrane (wing) together better. Either way, if it was fur then it would not clash with anything we know. There have been other discoveries into the possibility that the fur really was fur. We’ll just have to wait and see. These wings have also been portrayed as being able to fold backwards so they pterosaur could actually walk on all fours with his wings sticking up in the air, but with his hands on the ground. We aren’t sure how pterosaurs may have folded their wings but it is highly unlikely they did it like birds.